Since you sleep in the dark, you may also cover your hamster’s cage at night. Is this the right move? We’ve done some research on the topic to provide you the answer. You don’t have to cover your hamster’s cage at night. Hamsters are nocturnal animals. They sleep during the day and are awake at night. They’re also crepuscular, meaning hamsters are most active after sundown. Are there any reasons to ever cover your hamster’s cage? How do you get to them to sleep if they’re also up during the day? Keep reading, as we’ll answer those questions and more. What Good Does Covering Your Hamster’s Cage at Night Do? You know now that there’s no reason to cover your hamster’s cage at night. Can you still do it? Sure, you can, but does it do your hamster any good? The main reason you might feel inclined to cover your hamster’s cage is to create darkness in their enclosure. This is to establish a cozy environment for them to sleep. As we said before though, hamsters are nocturnal. That means they don’t go to sleep at night like we do. Trying to make them sleep at night and stay awake all day goes against their natural instincts. If you force your hamster to sleep at different times than what their instincts tell them, your hamster could become aggressive. They could bite when being handled or petted due to being overtired. You might also notice slowness, strange walking, and general lethargy according to posters at the Hamster Hideout forum. 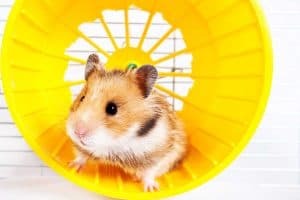 Do keep in mind that hamsters can also become overtired due to excessive humidity (warm summer weather or sticky hot climes) as well as playing too much. An overstrained hamster that is forced to sleep on a different schedule and has played too much could become stressed and sick. In some cases, they could even die. Also, covering the hamster’s cage reduces ventilation in the space. If you do live in a humid environment, this could contribute to a hamster’s dehydration. It’s also possible for the hamster to develop respiratory issues if they’re in a dirty cage and breathing in waste. 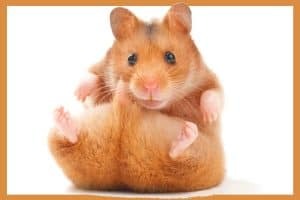 Your hamster is likely to urinate on and/or eat the blanket or covering. If they were to swallow a big enough chunk of blanket, they could choke. That could again be fatal. On that note, then, we’d say you shouldn’t cover your hamster’s cage. It certainly won’t make them go to sleep at night. They won’t slow down their activities, either. Covering a hamster’s cage can cause more harm than good, and thus it’s better to skip it altogether. The reason hamsters engage in so much activity at night is because they’re crepuscular. This is not a fancy word for “nocturnal.” It means they prefer doing the most after sundown and before sunrise. When you combine that with their nocturnal nature, that means there’s practically zero chance of a hamster sleeping at night. If they are dozing off after sundown, something is likely wrong. The nocturnal, crepuscular nature of hamsters dates back to their wild ancestors. Hamsters are small animals and thus can be prey to many bigger creatures. By staying out in the wild in plain daylight, the hamster makes itself an easy and quick lunch. That’s why, over the centuries, hamsters learned to burrow underground via ornate tunnels. There, they’d sleep the day away. Once the sun began to set and visibility was naturally lower, the wild hamster felt safe to venture out. They’d then forage for their next meal. Some species can tuck their food in their cheeks and carry it back to their burrow. Your hamster may wake up after sunup, which is again credited to its crepuscular nature. It will rarely stay awake long though, as this is prime sleeping time. How Long Do Hamsters Sleep Each Day? Now, not all hamsters will follow the above schedule down to the minute. Some pet owners may have hamsters that are awake during some daylight hours, but this is admittedly not common. Just like all people don’t go to bed and wake up at the exact same times, there are slight sleep/wake fluctuations from hamster to hamster. Most hamsters get about as much sleep as we humans do, which is six to eight hours. It’s not unheard of for a hamster to sleep up to 12 hours on occasion. That said, if this becomes the norm, it could be indicative of a bigger issue. You should set up an appointment with your veterinarian to be on the safe side. What If Your Hamster Isn’t Sleeping? Many pet owners will be at work when their hamster is inactive, so it’s hard to say if the pet is actually sleeping. Much like your hamster getting too much sleep can be indicative of a bigger problem, so too can getting too little sleep. You may notice that your hamster is up and at ‘em at night yet is also awake in the morning and the afternoon. Hamsters are abundantly energetic, and sometimes it’s hard to get them to calm down enough to sleep. Also, remember that hamster sleep schedule fluctuations do exist. That said, your hamster has to sleep sometime, and if they’re not, it’s a problem. There are a handful of methods you can try to attempt to ease your hamster into a regular sleeping schedule. For your hamster to get all snuggly, they need a cozy enclosure. You can provide one by laying down bedding material in their cage. The hamster will then create a little nook of its own in which it will sleep. If the bedding has become wet with urine or messy with feces, then you need to change it out. You should do this at least every week. Make sure you’re looking for droppings daily. Just like we people have a hard time sleeping in a loud environment, hamsters are the same way. They prefer the room they’re in to be as quiet as possible. Perhaps you relocate your hamster to the home office or a spare bedroom then. Do keep in mind that even though you’ll be at work and the kids will be at school during the week, once the weekend arrives, everyone will be home. That means putting the hamster in the living room or even a bedroom is not the best idea. It’s especially wise for you to keep your hamster out of the bedroom. All the noise your pet makes at night as it does its thing will probably keep you awake. You both deserve a quiet haven! If your hamster still isn’t getting to sleep on their own, make sure you’re playing with them regularly. We recommend providing them exercise at night before you go to bed as well as in the morning. Remember, since hamsters are crepuscular, these are their two biggest active times. 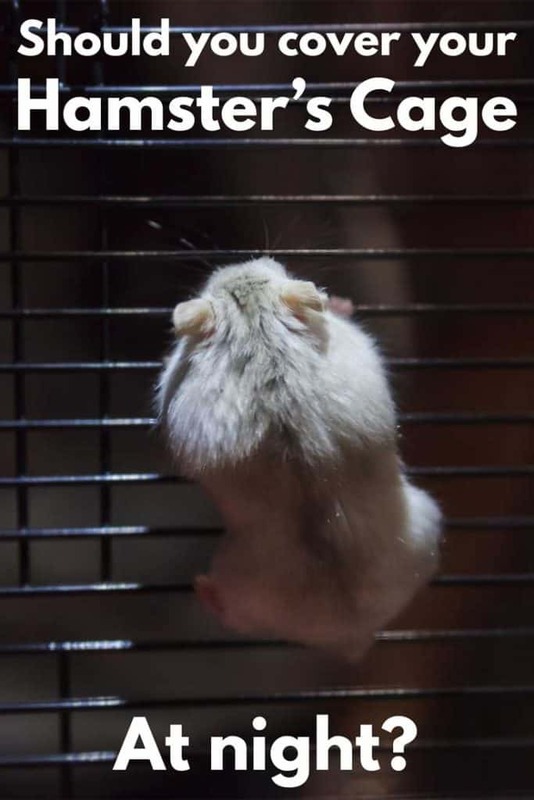 Exercise will fatigue your hamster to the point where they might fall asleep. You do not want to overtire your hamster just so they sleep, as that’s not healthy for them. The phrase “let sleeping dogs lie” should be modified to include hamsters, too. If your hamster finally does get some shuteye, don’t wake them up. It doesn’t matter what time it is, just let them sleep. They need the rest. We mentioned above what happens when you don’t let your hamster get sufficient rest. It’s no good for their short-term or long-term health. Once your hamster is awake again, you can start training them to get them on a more regular sleep schedule. Depending on your hamster species, their sleep schedule can be all over the place. If you have a Chinese hamster or a dwarf hamster, it’s not abnormal for them to be awake sometimes during the day. This is typically due to the way you condition them. 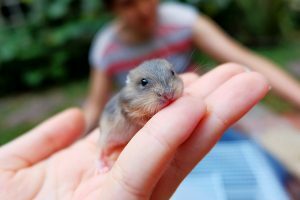 If, for instance, you play with them during daytime hours, the hamster will start to wake up then with the expectation of playing. Syrian hamsters will almost never wake up during the day. They’re purely crepuscular and nocturnal. Does your hamster play all night and then continue to play into the day? By removing their toys once the sun comes up, you might be able to encourage them to get some much-needed rest. Do make sure you put the toys back at night. When do you feed your hamster? By providing them with their meal in the evening, they’ll burn off their food later with play. That may mean that by the time morning arrives, they’re too tired to running around. If all else fails, then it’s best to call your exotic veterinarian and bring your hamster in. Sometimes sleep fluctuations or oversleeping may be caused by illness. If so, then you can discuss with your vet what to do next. If your hamster appears to be otherwise healthy, then your vet may be able to suggest other changes to the hamster’s routine that can help them sleep. Your Hamster Doesn’t Sleep When You Do, And That’s Okay! Pets often have different sleep schedules than us humans, and hamsters are no different. Your little fuzzy friend is nocturnal and crepuscular, meaning they’re more active at night and sleep during the day. While this doesn’t apply to every hamster, that’s the schedule most will follow. Covering their enclosure at night won’t stop this behavior, so there’s no need to do it. It could harm more than it helps!